A basketball star visited The Sixth Form College, Solihull this week, as the College launches its Basketball Academy in conjunction with the City of Birmingham Basketball Academy. 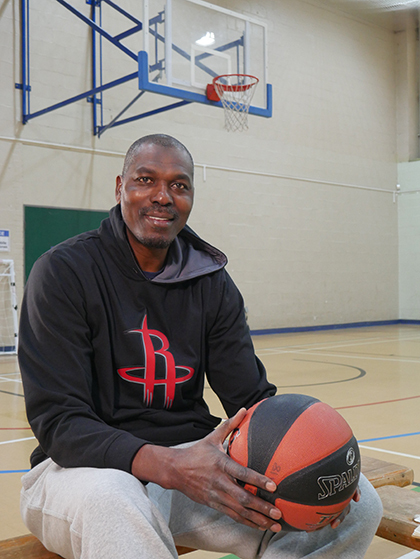 Former NBA star Hakeem Olajuwon, formerly of the Houston Rockets and the Toronto Raptors, was in College on Tuesday 7 November to film a media interview in the College’s Sports Hall. With him was Director of the City of Birmingham Basketball Club Rob Palmer, who will be leading the College’s Basketball Academy when it officially launches in September 2018. The Basketball Academy Taster sessions take place on 13 November, 5 February and 19 March (all from 4.00 – 5.00pm), giving players the chance to see what joining the Academy will involve. This opportunity enables them to develop their basketball skills, while studying A level or BTEC courses at the College. Anyone wanting to sign up for any of these tasters is asked to email marketing@solihullsfc.ac.uk with their name, current school and the date(s) they want to attend. The City of Birmingham Basketball Club’s association with Hakeem Olajuwon sees them host an annual Hakeem Olajuwon Basketball Summer Camp. Hakeem has a glittering NBA career behind him. In 1993–94, he became the only player in NBA history to win the NBA Most Valuable Player, Defensive Player of the Year, and Finals Most Valuable Player awards in the same season. He won back-to-back NBA Championships against the New York Knicks and Orlando Magic and in 1996, he was a member of the Olympic gold-medal-winning United States national team. He has been selected as one of the 50 Greatest Players in NBA History.